I love snacking on Budget Saver Ice Pops because they taste great and don't cost a lot. Plus, I can find them in almost any grocery store in my area. I have been saving the leftover sticks, hoping for a reason to use them eventually. With the holiday season here, I realized I can use them to make ornaments! This is a wonderful repurposing DIY that prevents waste, and is fun for kids. These stick ornaments are chalkboard ornaments. So once they are painted, hand them out at holiday parties or family get togethers for adults and children to draw on with colorful chalkboard pens. Erase the chalk. Then save them for next year. One ornament is a gingerbread house, the other is a frame to write names or draw family members. Find your Buget Saver Ice Pops through the store locator under the "Find Favorites" tab. And don’t forget to save the sticks! Create a square with popsicle sticks. Coat one side of another popsicle stick with Modge Podge or glue and lay across square. Lay across the edge of square. Lay four sticks around the sides to create a border. Coat front of ornaments in colorful or black chalkboard paint. Allow to dry and paint a second layer, or follow paint brand instructions. Use a glue gun to stick ribbons to the back of the ornaments. 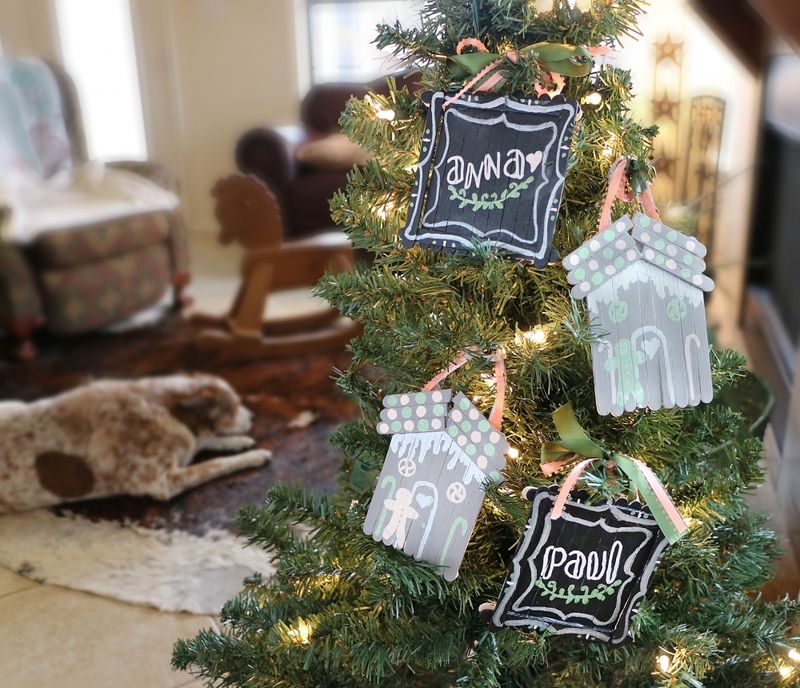 Draw on ornaments with chalkboard paint pens. Erase and redraw as you please. Hang on a tree, doorknob, door, or wall. Cut popsicle sticks, and glue onto square to create a roof. Find all of Jasmin Fine's craft ideas and recipes at 1finecookie.com. On the site, check out the how-to video for DIY Ice Pop Ornaments!